Already on the first night it saw an all-time attendance record. After over three years of reconstruction Stade Vélodrome is now ready for Olympique and for Euro 2016. Exactly 61,846 people watched the Olympique – Toulouse encounter, won 2:0 by the home side. This means the previous record from the 2004 Newcastle game (58,897) was beaten noticeably. And there’s still room for future records with over 67,000 seats available. 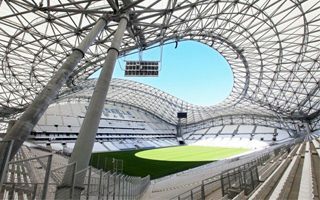 The return to Stade Vélodrome proved spectacular then, even if Olympique had been playing here throughout the reconstruction. It wasn’t until last week that the entire project was officially delivered and now regular operation should begin. Public tours will open on October 25 and will be free for two days. Eventually Ligue 1 games will be joined by a wide range of other events: international fixtures (France – Sweden, 18/11), rugby games, concerts, Euro 2016 and later even a Champions League final are planned. All of the events are necessary as the stadium changes its mode of operation. Though Stade Vélodrome remains owned by the city, it will now be operated by Arema, a subsidiary of Bouygues. The contractor covered all construction costs (€268m), but will in return collect a big chunk of the revenues, while also receiving €12 million from the city annually for 30 years. To ease the city’s burden, Olympique will provide most of that yearly contribution in lease fees. Though the lease is one of Europe’s most expensive, the stadium also has more to offer than most arenas. Roughly 6,000 business seats, 80 skyboxes and a total of 67,394 capacity should be well enough to make it a win-win for all partners. Especially if Olympique continue their great run, currently being the leader of Ligue 1 with 7 points above archrivals PSG. As we’ve shown you throughout the construction period, the stadium was almost completely rebuilt since 2011. The west grandstand was built from scratch with nearly 19,000 seats, the east one expanded and both ends re-equipped. Then, topping all of that came the amazing roof structure, weighing 6,000 tons and dominating Marseille’s skyline.